This cake never goes stale. Is that because it is a drenched syrup cake with an almond base and many many eggs or is it because it is so damn delicious there are never spare slices left behind to go stale? No one will ever know. . . So I found myself home alone on Saturday morning and having done all of our much needed house and garden work I decided to count up all of my jars of jam. Oh yeah thats another thing that I have been doing instead of writing here. Jam making. Lots of it. If anyone has ever read Margaret Mahy’s Jam then you can kind of imagine what our house looks like. There are secret depositories of preserved delight hidden all over the show, including in an old shoe box under the sofa! Even though the task of making my own wedding cake has been completely removed from my hands (because lets be honest I would prioritise icing over having my hair down the morning of) I am still going to pretend like I need to make a hundred prototypes as part of my "research". A few weeks ago I was approached by The Blind Foundation to share a recipe for their upcoming Bikkie Day on the 2 July. Being an avid lover of bikkies and puppies I could hardly say no although being the terrible person that I am I procrastinated until the week before to actually make a recipe to share. Partaking in Bikkie Day helps to raise money for the breeding and training of Blind Foundation guide dogs. So I just realised it has been six months (aka HALF A YEAR) since I last posted something. HOW?? How has this much time gone by without it even feeling like it? That is terrifying. As my (almost) four year old nephew would say, I'm getting oooold. When I was given my two weeks redundancy notice at my old new job I decided to make the most of its Parnell location and visit a cafe nearby called Winona Forever as frequently as I could. I do believe that it was in fact named after Johnny Depp's Winona forever tattoo on his arm, that aside it has the most incredible cake selection. I brought home one evening a wee cheesecake to share. It was a delicious biscuit base with creamy ricotta filling with candied macadamia nuts and salted caramel all over it. It was outrageous and since then I have been eager to make such a delight. I finally had the occasion and the courage to attempt such a feat. Having made cheesecake only twice in my life (the first being a total fail and the second being a cheats Nigella recipe) I was rather nervous and pawed over multiple cookbooks for tips, tricks, and ideas. 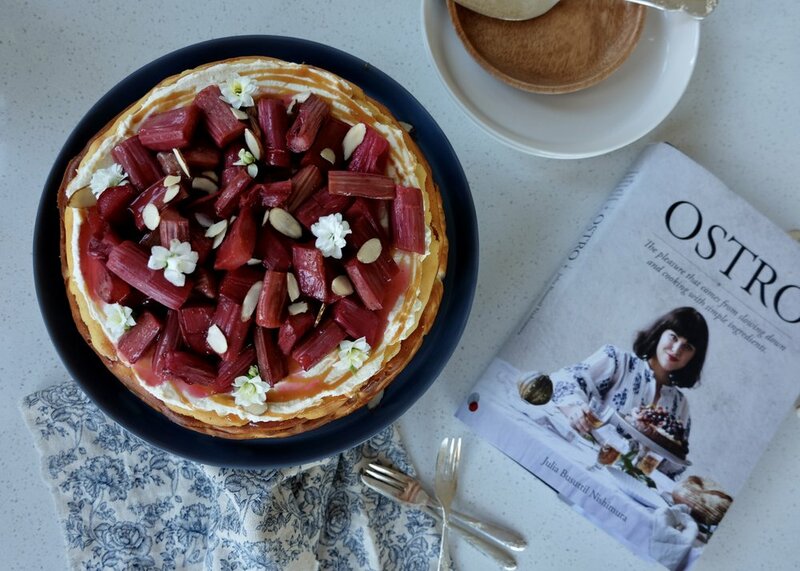 There was a recipe in Julia Busuttil Nishimura's Ostro for a roasted fig and grape ricotta cheesecake and a recipe in Angela Redfern's Ripe Recipes - a fresh batch for a gingernut and rhubarb cheesecake. I kind of wanted both at the same time so I combined the two and wrote my own recipe. In hindsight this was an incredibly risky thing to do for someone who next to no cheesecake experience but I guess when a girl knows what she wants she just has to go out and get it. I was once told that you had to bake a baked cheesecake in a water bath to prevent it from cracking on the top and if you did crack your cake you were a bad person and a failure. I think this is what gave me this idea that cheesecake was incredibly hard to make. I then thought about it and going to the faff of preventing cracks from forming when you are just going to cover it in all sorts of delicious topping is just a waste of time. Even if you aren't going to put anything on top who cares if there are cracks? It's cheesecake, it's comfort dessert, it's meant to be rustic and homely. I won't let those perfection pursuers put me off making something this damn delicious again! A food processor and a standing cake mixer really help when it comes to making this. If you have neither then a plastic bag, a sturdy arm, and an electric hand beater will do the trick just fine. Patience is also required. This needs to sit in the fridge overnight for it to be sliceable so it definitely isn't an impulsive craving creation (unless of course you can predict your cravings). 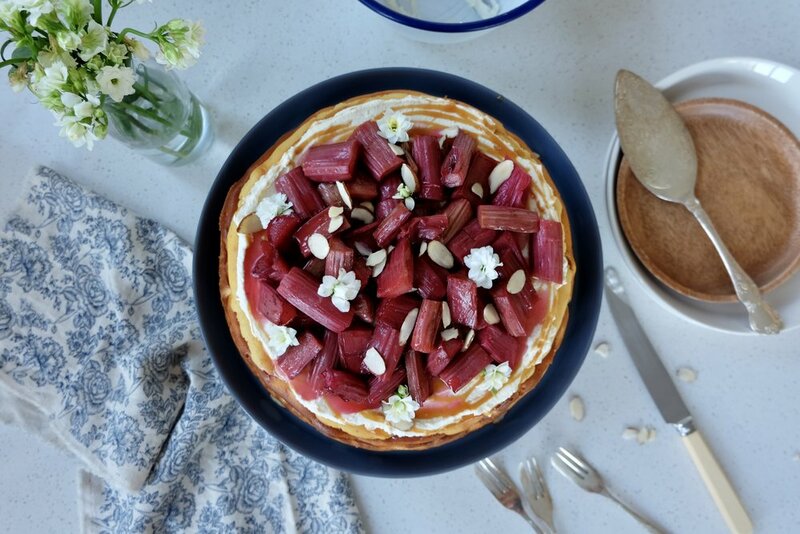 The relatively low sugar content within the filling itself really makes the creaminess of the ricotta sing as well as being a great complement to the tartness and sweetness of the rhubarb and caramel. 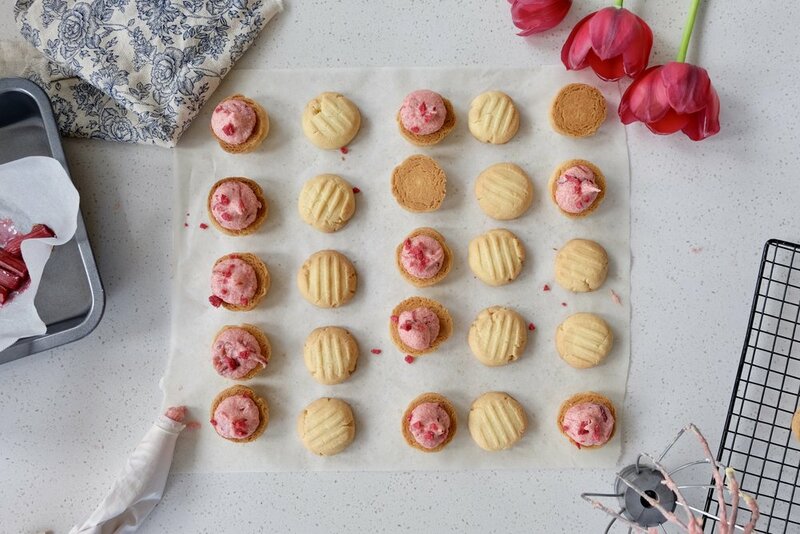 Line the bottom and a few centimetres up the sides of a 23cm spring form cake tin with baking paper. Crush the biscuits in a food processor to a fine breadcrumb consistency and then whizz through the melted butter until evenly mixed. Press the crumbs firmly into the bottom of the prepared tin. Leave to set in the fridge while you do the next step. Preheat the oven to 170 degrees celsius on bake. In a standing mixer with a whisk attachment whisk together the ricotta and cream cheese until reasonably smooth then whisk in the sugar, cream, flour, vanilla, and lemon zest. Add the eggs one at a time and whisk thoroughly between each addition. Scrape this mixture onto the chilled base and then bake in the oven for 50 to 60 minutes. Brown spots should start to appear and the cheesecake should be just set if wobbled gently. Leave to cool on the bench before leaving in the fridge overnight to fully set. The next day heat the oven up to 180 degrees. Chop the rhubarb into 2-3cm pieces then toss in the sugar and vanilla then bake in a small dish for 30 minutes until soft. Leave to cool to room temperature before using. If making caramel now would be the time to make it (recipe here). 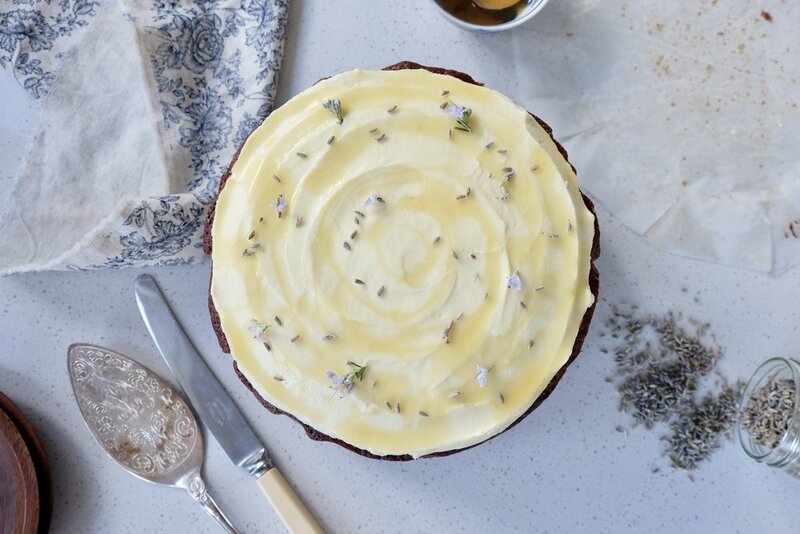 To assemble, run a sharp knife around the edge of the cheesecake, remove the sides of the cake tin and carefully flip the cake onto your hand to remove the base and baking paper then flip again onto your serving plate. Whip together the cream and ricotta (and a touch of vanilla bean if you fancy) then spread that over the top of the cheesecake. Drizzle over some warm caramel and then top with the rhubarb pieces, flaked almonds and flowers if you fancy. Serve with more caramel on the side. 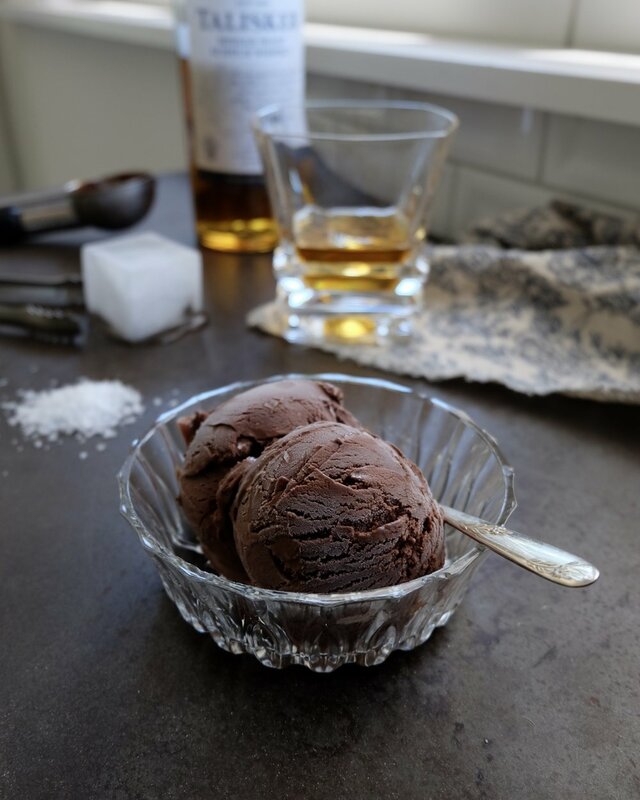 I am going to toot my own horn here and say that this is the best ice cream I have ever made. I first wrote about these date scones yonks ago. This was back when I had an iPhone 4 as a camera and long before having an eclectic and staged array of objects in the frame was fashionable. Recently I've made it my mission to write a cookbook and whilst my new images are no where near suitable it forces me to double check the recipes that I hold most dear. It also means Dylan's work gets a lot of morning tea. I used to think making brioche was a bit of a faff. The patience required to gradually and gently knead cubes of cold butter into the dough was enough to put me off the delicious breadstuff. 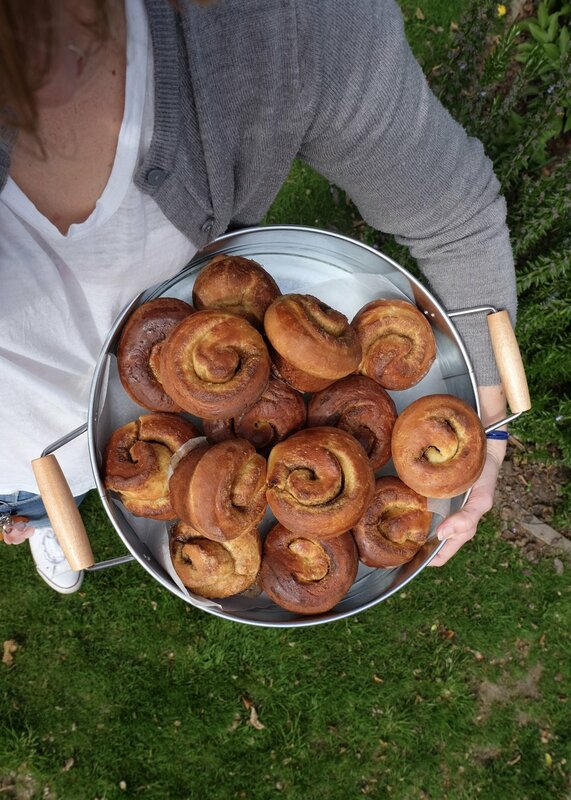 It wasn't until my friend Cara pointed me in the direction of the brioche recipe in Ripe Recipes did my brioche world change. With our kitchen still covered in dishes from the night before and a hint of anchovy still lingering in the air, Dylan requested I make pancakes for breakfast this Labour day.